On 26 June 1863 David Buchanan, together with three daughters aged 23, 18 and 14 and a son aged 11, boarded the sailing ship Ganges at Gravesend in Kent. The ship was bound for Auckland in New Zealand, and the Buchanans were bound for a new life. David Buchanan was a 55 year old Scot, born in Montrose, who had been a successful journalist in Edinburgh and Glasgow, where he had worked on the Caledonian Mercury and, to modern readers, the better known Glasgow Herald. His wife had died in childbirth in 1855 and David Buchanan had himself been advised to seek out a healthier climate to counter a debilitating illness: New Zealand seemed the perfect solution, and the family had been granted 120 acres of land in return for emigrating to the fast growing colony. David Buchanan kept a detailed journal of the 111 day voyage to New Zealand, and some months after the end of their journey this was serialised in 13 twice-weekly parts in the Glasgow Herald under the title "Life in an Emigrant Ship". 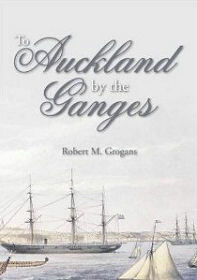 "To Auckland by the Ganges" by Robert M Grogans is, in effect, the text of Buchanan's serialised journal, edited to make it more readable for a modern audience used to straightforward language, and paragraphs. Plus an introduction setting the account in context and a number of appendixes setting out, for example, nautical terms used in the text and a passenger list for the Ganges. The result is an utterly fascinating book that should be regarded as essential reading for anyone interested in the story of Scotland. Many Scots in the 1700s and 1800s shared the experience of leaving their homeland for what they believed to be (and usually was) a one way journey to a wholly new and different world. Yet the actual process of getting from Glasgow or Portree or, in this case, Gravesend, to Canada, the United States, Australia or New Zealand, is usually hidden from view. Accounts usually show emigrants boarding their ships, and in the next paragraph arriving at their destinations. The sheer endurance required by the intervening process is usually hidden from view. As a professional man, Buchanan could afford to travel cabin class and dine at the captain's table, and he was leaving his homeland willingly rather than under compulsion, unlike many of those cleared from their land in Scotland over the previous century. Nonetheless, the insights gained from reading this book add a previously unseen dimension to the stories of so many Scots.